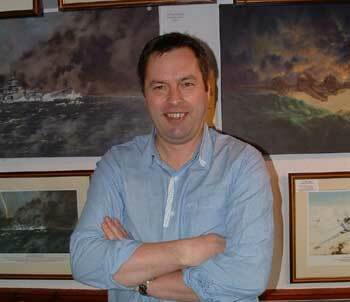 Mark Littlejohn has completed many military art works in many mediums for all branches of the British armed forces. He has also completed many works for veterans and veterans organisations both within the United Kingdom and abroad. As a serving officer within a local light infantry corp he has completed military art paintings for the regular light infantry and for his own battalion, "The Rifle Volunteers". His work is in many private collections and in regimental messes and warships such as HMS Cornwall. He also enjoys working in all mediums, especially oils but also gains satisfaction from working with just a pencil and trying to achieve, as Mark puts it, "colour and movement within the various shades of black and grey"